A lot of science fiction novels have a tendency to get bogged down in weighty themes, big ideas and serious, brooding characters – which is why the occasional book that throws a little humor and wit into the mix can be a welcome respite. 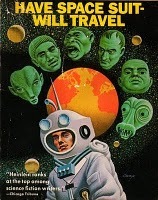 Robert Heinlein’s Have Spacesuit Will Travel is one of those books. As both a fast paced swash-buckling adventure tale across the farthest reaches of the galaxy and as a wry, humorous parable about a teenage boy who learns how to realize his dreams, the book takes off at a frenzied pace and doesn’t let up. Written during his “Juveniles” period, in which he published books aimed mainly at teenage boys, the book crackles to life with an energy that is infectious to readers of any age. Heinlein’s writing is sharp, smart and efficient (as well as funny) and manages to even make the mechanical intricacies and practical necessities of spacesuit design seem interesting. If you’re looking for some light Sci-Fi reading and a change of pace from your ordinary space operas, you can’t go wrong with this book. Summary: The hero of the story is a teenage boy named Kip Russell. Scientifically inclined and obsessed with finding a way to travel to the moon, Kip enters a jingle contest for the Skyway Soap company in which first prize is an all expenses paid trip to the moon. Although he fails to win the grand prize, Kip perks up when his second place prize is delivered to his house: a real life spacesuit. Kip spends the summer fixing up the old space suit to the point where it’s actually in working condition, even though he still has no way to get where he wants to go – all the while planning and scheming on how he is going to make enough money to cover the tuition for his first semester of college. Kip starts to think that his dreams may have to be put on hold for a long time, until one eventful afternoon changes everything. Trying on his fully functional suit in his backyard one last time before selling it to help pay for school, Kip picks up a Mayday signal from someone on his suit’s radio. To his amazement, two flying saucers land near him and, next thing he knows, he’s captured and taken to the moon where he is held captive by a group of alien uglies that look like they have worms growing out of their faces. Luckily he’s not alone. Joining him in captivity is a young girl named PeeWee (the one who sent the original radio message). She explains to him that they’re being held by a race of “Wormfaces” who we eventually learn are plotting to take over the earth for their own nefarious purposes. Also in captivity is a being known as the “Mother Thing,” a kindly, telepathic creature who PeeWee informs Kip is also sort of like a policeman for the galaxy (obviously trying to stop the Wormfaces). After a series of heroic escapes in which Kip uses his intelligence and ingenuity to save the day, including one across the moon’s surface in which we learn a lot about the workings (and limitations) of a spacesuit, the trio are eventually saved by the Mother Thing’s people and taken to their home planet: Vega 5. There they are made witnesses of and participants in the trial of the Wormfaces in what seems to be a sort of galactic court. Unexpectedly, however, the Wormfaces aren’t the only ones put on trial. Although they are considered heroes for helping stop the Wormfaces and saving the Mother Thing, they are made to stand trial for the entire human race -a race that the court has decided may some day pose a threat to peace in the galaxy (due to our penchant for explosive weapons and territorial aggression). While I won’t give away the ending, the question of whether the story written for teenage boys has a happy ending is probably not too hard to figure out. Review: Even if the story seems a little childish and unsophisticated compared to some of the muli-dimensional, multi-character epics of science fiction, don’t let that fool you. What elevates this book above the majority of fiction written for the teen age group is that Heinlein never talks down to the reader, and that is exactly why this is a book that would have been just as entertaining to my 13 year old self as it was to my 32 year old mind. Sure, it may not be a mind-expanding, paradigm-shifting, otherworldly tour-de-force. But sometimes that not what you’re looking for in a book. If you’re looking for a quick, absorbing and fast-paced read while your sitting by the pool this summer (or gazing up at the stars), you couldn’t do a lot worse than this one. And if you’re of the type of intelligent, ambitious and searching souls as young Kip, you’ll find even more stuff in this book to relate to and dream about. This entry was posted in Alien Contact, Hard Science Fiction, Uncategorized and tagged Robert Heinlein. Bookmark the permalink. Thanks for the list. I must admit, I find Ender’s game hard to read and Card in general difficult to relate to. I long for more female characters and humor. Vonnegut does a good job with this in Galapagos, one of his later novels and somewhat unsung.